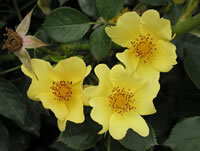 The Baby Love miniature rose was first bred in 1992 in the United Kingdom by grower and breeder Len Scrivens. 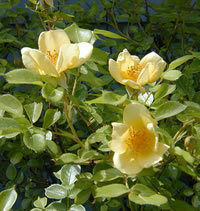 Later that same year this rose won the Royal Society of England's Gold Medal. This is truly a distinct honor as only one of these awards is handed out in any given year and it represents the very best of almost 100 different competing varieties. This rose was introduced in the United States shortly after by Heirloom Roses as Baby Love, where it is still commercially available today. These miniature Baby Love roses are actually quite stunning as they produce ample blooms in a deep yellow color that average around 2 inches in diameter and produce a subtle fragrance that smells like licorice. The blooms are mostly solitary with just a few petals, usually 4 to 8, and this plant is considered near thornless so it is a great choice for younger growers, or those who have an aversion to having their fingers pricked. The Baby Love miniature rose stays very compact growing anywhere from 18 inches to 36 inches tall, with a spread roughly equal to its height. 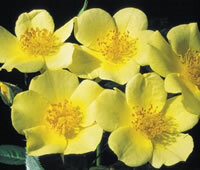 Baby Love miniature roses are a great choice to plant in borders and smaller flower beds. They also make excellent container roses and you can even use them for ground cover if you keep them pruned low. 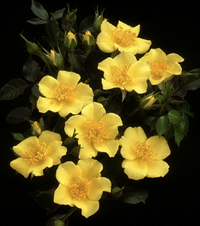 This variety is fairly hardy in zones 6 through 9 and it has excellent resistance to diseases which is unusual for yellow roses. If you dead head this rose you will see occasional blooms later on in the season. Most growers will probably end up growing their Baby Love roses in containers because they seem more suited for their short stature. If you decide to do so as well, make sure you understand that there are different growing requirements than if you plant them in the ground. Container plants require much more attention than those just planted directly in the soil. For instance you will need to monitor their moisture level more closely and regular feedings are necessary if you want as many blooms as possible. The benefit to growing roses in containers however is you can take them inside and continue to grow them over the cold winter months. How you plant your Baby Love miniature roses depends on how you initially received them. If you were fortunate enough to find them for sale at your local garden center then you probably got them in a 2 or 3 gallon container already blooming or just getting ready to. Container roses are the easiest to plant. If you are planting them in the ground, a good rule of thumb is to dig the hole about twice the diameter of the container they came in and of an equal depth (because you want the bud union to remain at the same depth it is in the container). If you are moving the plant to a larger container, I typically double the size of the container for most varieties I replant. If you received your miniature Baby Love roses as bareroot plants, then you have a little more work to do. The hole (or container) you are planting into should be wide enough to accommodate the roots naturally, and deep enough to set the bud union about an inch or two below the surface of the soil. I also like to have a bag of organic compost on hand when I'm planting and I will mix it in with my soil at a ratio of 2 parts soil to one part compost. I have had very good luck with roses using this practice. Caring for your Baby Love miniature roses is much the same as caring for any traditional rose, however if you are growing them in containers, you have to pay extra attention to them. 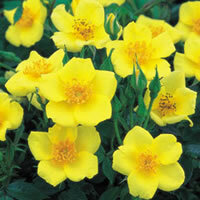 For starters, this variety loves full sun light and it does not do well in partial shade. You also need to make sure you keep your containers properly watered. Once you see the top inch of soil dry, it's time to water it again. You should try to find a location that has good air circulation as rose in general do better if they do not stay damp for long periods of time. This variety is no different! Miniature Baby Love roses grown in containers often need regular feedings in order to encourage continual blooms. I suggest you start off by feeding them every 4 weeks and see how yours do. Some miniature growers will feed as often as every 2 weeks but you have to be careful as excessive feeding can cause your roses to grow rampantly and have sparse, irregular blooms. Pruning your Baby Love miniature roses is the same practice as you would a full size rose. Start off by removing all the dead and diseased canes and start removing overlapping canes so that the leaves do not compete for sunlight. This is almost always done in late winter or early spring and this is a good time to clean up all the fallen leaves from the previous growing season. Never leave cuttings and rotting leaves lay around the base of your roses as this is an invitation to diseases and pests. Once you have done the basic pruning, you can go ahead and cut back the canes that will remain by about one third of their length. If you live in a colder region you may discover that you have to cut them back to more like one half of their original length. You have to make sure that your miniature roses are protected from spring freezes and if you grow your minis in containers, you cannot leave them outside over the winter months as they are unlikely to survive.